This is the second in Jane Smiley’s Last Hundred Years trilogy which follows the lives of one American family across a period of a century. The first book, Some Luck, took us from 1920 to the end of 1952, and this one, Early Warning, covers 1953 to 1986. It had been almost two years since I read Some Luck, so I was worried that I would struggle to remember who the characters were and how they were related to each other. 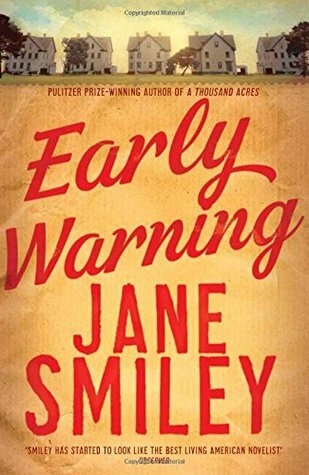 On beginning Early Warning, then, I was relieved to see that Jane Smiley addresses this problem by beginning the novel with a family gathering – the funeral of Walter Langdon, the man who, with his wife Rosanna, had been at the heart of the previous novel. The funeral is attended by all of his adult children – Frank, Joe, Lillian, Henry and Claire – some of whom are now married and have children of their own. As the family sit around a table reminiscing about the past, this gives the reader a chance to get reacquainted with the characters. So far so good, but once the different branches of the family depart and go back to their own homes, things quickly become much more confusing! In the previous book, the action revolved around the Langdon farm in Iowa, but now that the children have grown up, some of them have moved away and there are now Langdons scattered all over America, in different towns and different states. As the years and decades go by, moving from the 1950s to the 60s, 70s and finally the 80s, the grandchildren grow up too and build lives of their own, bringing even more characters into the story. I was constantly referring to the family tree at the beginning of the book and can’t imagine how I would have coped if I’d been reading it as an ebook! The novel follows the same structure as the first one, with one chapter devoted to each year. As I mentioned in my Some Luck review, this means that, although it keeps the story moving forward, we are also left with some big gaps. When we leave the characters behind at the end of one chapter, we leap straight into the middle of the following year with the next chapter and haven’t ‘seen’ everything that happened in the meantime. It’s an unusual way to structure a novel and while it’s successful in the sense that it makes the trilogy feel different and memorable, it’s too restrictive and I’m glad not all books are written like this! There is really very little more that I can say about Early Warning. There are some dramas, of course – births, deaths, marriages, divorces, affairs, house moves and changes of career – but there is no real plot, any more than anybody’s life ‘has a plot’. With so many characters, I couldn’t keep track of everything that was happening, but some of the things that stood out for me in this book were the exploration of Frank’s wife Andy’s mental state and the therapy she undergoes, the rivalry between their twin sons, Michael and Richie, and the pressure Lillian’s husband Arthur find himself under as a result of his job with the CIA. I was also particularly intrigued by the introduction of a new character, Charlie, whom we first meet as a small child and who appears to be unconnected to anyone else in the book. Smiley writes very convincingly from a child’s perspective and I really enjoyed reading these sections and guessing how Charlie would eventually fit into the story. Some of the major events of the period are featured too, including the Vietnam War and the Cold War, and whereas in Some Luck the family on their Iowa farm were largely sheltered from the outside world, this time, because the geographical scale of the story has broadened, there are family members affected in some way by almost all of the world events touched on in the novel. I have now started the third book, Golden Age, but with yet another generation of characters to get to know, I’m anticipating an even more confusing read than this one! Confusion! It has been the hallmark of much of my reading in the past year. Perhaps a parallel to the way life is in the early 21st century. I too was glad she included a bit of re-introduction of the characters. I hope she does that in the final volume because it has been quite a while since I read Early Warning. I once got fairly far in her nonfiction book, 13 Ways of Looking at the Novel published in 2005. She opened my eyes to the many forms of fiction throughout history and I think in this trilogy she was trying something new with form. She certainly brings the experience of the 20th century in America to life. I have just started the final book and she does begin with a family gathering again in this one too. Of course, the family is even bigger by now! That non-fiction book sounds interesting – I haven’t read any of her other work yet apart from this trilogy. I think you are understanding my comments about this series a bit better! I read these books much closer together, too! I must say, I like that cover much better than the one on my book. Yes, I understand how you felt about this series now! I started Golden Age as soon as I finished this one – I think it’s definitely a good idea to read them as close together as possible. Yes, or you’ll never remember who’s who! Although she keeps adding characters, too. I think the only thing that saved the series for me was the discovery of the mystery child in the second book. I usually love such generational trilogies, though this one does seem a bit confusing, but let me try and start with Some Luck! Thank you for an insightful review! Some Luck is easier to read as there are not as many characters, but I’m reading the third book now and struggling with the number of generations! I’m enjoying this trilogy overall, though. I too love generational sagas and I have to say I am tempted by this. It’s such a vast undertaking and a structure that sounds both intriguing and restricting. Perhaps I’ll wait until you’ve read the final book in the trilogy, Helen, before adding what would be a massive commitment to the already overwrought tbr! The structure is unusual, but it means we are only given a snapshot of the characters’ lives in each year so there’s a sense that a lot is being left out in between. It keeps the story moving forward, though, and I think it works overall. I love Smiley’s work and have read almost everything she’s written … apart from this trilogy (and the weird Decameron one that was just TOO RUDE). These are the only Smiley books I’ve read so far, but I’m sure I will be reading more…maybe not the Decameron one, though! The thing about her is she writes in a different genre each time, which I love. A Thousand Acres and Moo are very good, I also like Horse Heaven.